Star Trek Online is a game that offers a deep and complex experience for its players, allowing them to not only explore strange new worlds on foot but also fly and fight through the spaces between them. As the game has matured over the last six and a half years, it has grown in scope, offering more and more interesting ships, items and powers for the player to exploit during their trek through the stars. Translating this complexity to a console control scheme was a daunting task to say the least. Ultimately, we wanted to retain all the features of the PC experience so that when you play Star Trek Online on a console, you are playing the full experience and not a watered down version of it. To do that, we had to figure out how to make the very focused nature of the console experience work for us. This meant paring down the HUD and control scheme to work seamlessly with a standard console controller layout – while retaining the tactical choices that makes combat in STO fun. It also meant redesigning the entire game’s UI to present itself at a fixed resolution with a slick and intuitive user flow. One of the most important aspects of STO’s moment-to-moment gameplay is the selection of abilities your captain uses to command their starship in space. The list of these abilities is large and ever-growing as we continue to add new ships and new bridge officer specializations to the game… so we knew that the console HUD had to be flexible and expandable. Ultimately, we settled on a radial menu that allows captains to quick-slot favorite abilities that will always remain on the screen while also allowing them to open a large wheel that houses abilities in standard categories (Special, Science, Tactical and Engineering). Captains can use any ability in the radial wheel by simply pointing at the desired ability and pressing the appropriate button. Captains may even cast multiple abilities in sequence this way if they keep the radial menu open, allowing them to fire off a quick burst of abilities easily – a crucial time-saver that could mean the difference between victory and defeat. Off the battlefield, captains make important choices about how they gear their ship, how to train their officers and what course to plot next. On PC, all of these UIs could float freely and even simultaneously on the same screen. While flexibility is a cornerstone of PC gaming, on consoles we have a fixed resolution and aspect ratio to work with. We also needed to consider the fact that most players will be sitting a good distance away from their televisions while playing STO on console so most UI elements need to be bigger than they are on PC. Those considerations led to a completely redesigned UI that is cleaner and more consistent than its PC counterpart. The fixed resolution means that we always know how big an element will be, which makes it easier to plan the layouts of certain windows and to make things fit “just so.” The larger font size requires careful planning and has forced us to make many UIs that used to be floating windows into full-screen UIs. This gives the UI more breathing room and helps greatly reduce clutter, while making it easier for captains to focus on one task at a time. Adapting the game to this new format has also allowed us to embrace the iconic LCARS style to an even greater degree, capitalizing on the hierarchy and split-screen elements inherent in the LCARS aesthetic as they fit perfectly with the directional input paradigm used by console controllers. We’re excited for players to get their hands on the controller and experience the game in a whole new way. 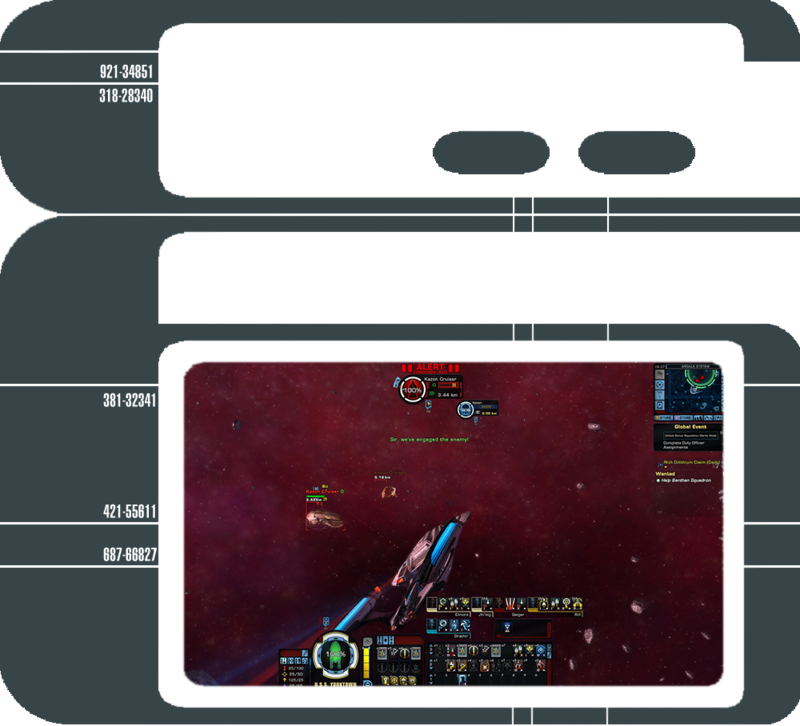 The new console UI maintains the depth of Star Trek Online while improving the moment-to-moment experience for consoles.